PRESTON CENTER OF COMPASSION COUNSELING SERVICES was begun in 1992 on the Preston High School campus, in response to the need for quality, affordable psychotherapy services and counseling, where Bronx women, children, adolescents, and families felt trust and confidence. In 1994, PCC responded to the needs of local Bronx families during the summer months for affordable safe recreational programs for their children and began PCC SUMMER RECREATIONAL PROGRAM on the Preston campus. 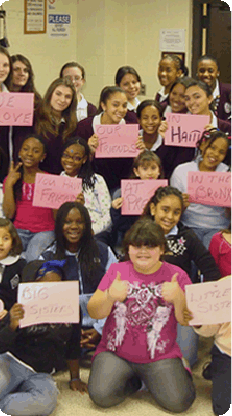 With a deep desire to develop and expand empowerment and leadership training programs grounded in compassion with and for adolescent and young girls in the local Bronx community, PCC began its BIG SISTER LITTLE SISTER PROGRAM in 1999, connecting little girls from Throgs Neck Public Housing, PS 72 and the Throgs Neck community with Big Sister Mentors each week at Preston. In 2001, PCC began a SENIOR RUN PROJECT outreaching, connecting and responding to the needs of senior citizens and the homebound elderly. In response to local children’s needs and parents requests for affordable tutoring, homework help and IEP services, PCC began its AFTERSCHOOL TUTORING PROGRAMS in 2003. Connections were made by PCC with the Montefiore Community Center and NYC Youth Corps employment program to engage low income teenagers in college and employment preparation and experience. These adolescents are trained in leadership and supervision of children, and are employed in the PCC summer recreation program each year. In 2016, we recognized a need for ENGLISH AS A SECOND LANGUAGE CLASSES in the Throggs neck area of the Bronx. In response to this PCC started an ESL program in Throggs Neck Housing at Kipps Bay Boys and Girls Club. This class provides a simple and very affordable way for people to learn the English language with extraordinary faculty at a convenient location. Preston Center of Compassion became incorporated in 2003 to continue and expand existing programs and outreach activities especially with those who are poor and most in need.